After the the ‘ifs’ and ‘coulds’, news is that Manchester United will sack Jose Mourinho will be sacked after today’s match with Newcastle. 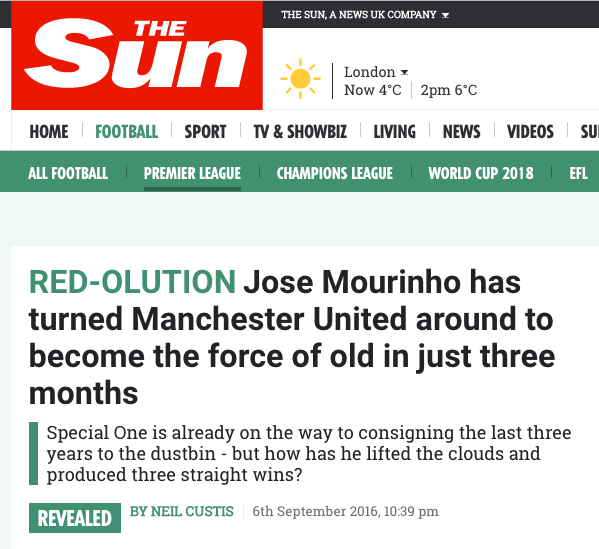 the BBC has the scoop, although it’s one founded in the Mirror’s story: “Jose Mourinho set to be sacked this WEEKEND whatever Manchester United’s result vs Newcastle.” Win 19-0 in a match that will reverberate through time and Mourinho will be sacked. Play out a thrilling encounter, as Mourinho unleashes Sanchez, Pogba and Martial with the command ‘express yourselves’ and still be sacked. How can the Mirror be certain? 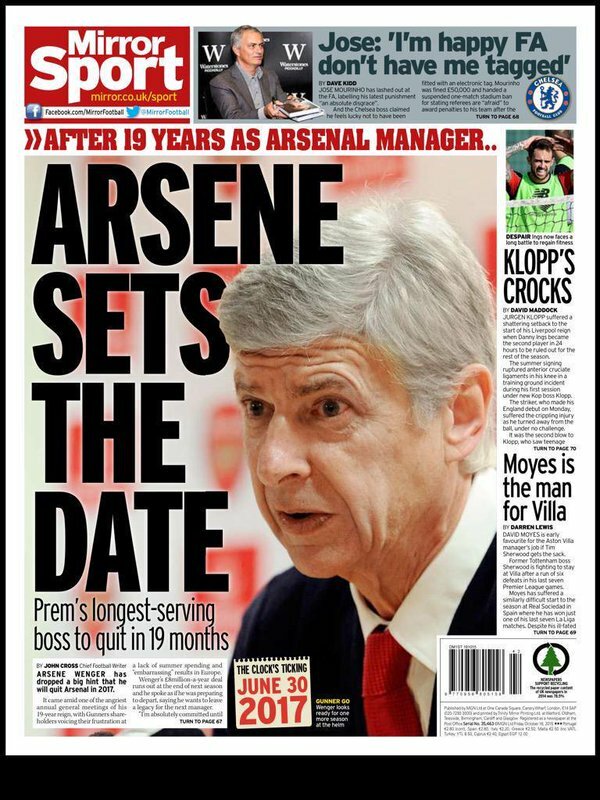 After all, this is the paper that told us Arsenal Wenger had ‘set the date’ to leave Arsenal on June 30 2017. He was sacked a year later. David McDonnell writes: “Jose Mourinho has lost the confidence of the Manchester United board and is set to be sacked this weekend.” And replaced by? Dunno. We also don’t know the identities of the “senior United sources” who gave the Mirror its story. We’re told Mourinho has “alienated players, fans and staff at Old Trafford”. And Mourinho “appeared resigned to his fate” in the pre-match press conference. Even though the club’s shares have slumped 17 percent since reaching a record high on the last day of August, they’re up 27 percent since the Portuguese manager took over in May 2016. Mourinho the manager is damaged goods; but Mourinho the brand is doing ok.
And then we get more hunches: “Ex-Real Madrid boss Zinedine Zidane is the favourite to succeed Mourinho, who is set to receive compensation of around £20million. Michael Carrick could be put in temporary charge.” United fans want Carrick as manager? 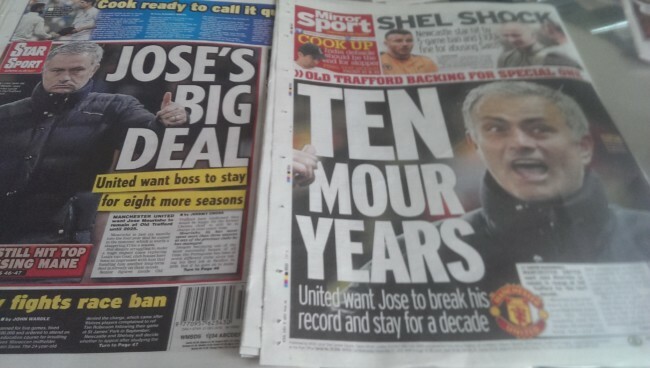 And sd a £20m goodbye a reason for Mourinho to look “sullen”? Yes, he’s rich but you could always use a few million more, right.